Thaw paneer,cut into thin strips and keep it immersed in hot water till use. Cut the carrots into diagonal slices and beans too diagonally as shown in the picture.Cut tomato into four,deseed it and cut into thin strips as well. Heat pan with oil and temper with the items given under ‘To temper’ table. Fry for 2 minutes till the masala gets cooked.Now add the cut carrot,beans,fry for a minute. Add 1/4 cup water and cook covered for 4 – 5 minutes. The veggies should get cooked as well as it should be crunchy. Add methi seed powder at this stage. Add capsicum and tomato and stir well. Lastly add Paneer and toss well in high flame. Cook for 2 minutes until the curry turns shiny.Add lemon juice and give a toss. Changes I made to the original recipe are,I omitted methi seeds and kalonji seeds(onion seeds) in the tadka part. Also I added roasted methi seeds powder instead towards the end. Original recipe asked for amchur powder,I had no stock so added lemon juice. So if you can get the above items,you can try that too. Transfer to the serving bowl.. I like to wrap it in thin rolled roties and enjoy! Excellent….I am getting this done tonight for phulkas as I have made aam ki chutney and was wanting to make another dish just in case my husband thinks the chutney is too sweet! 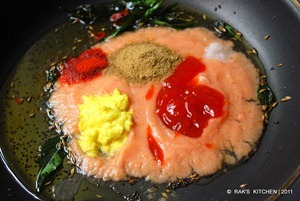 Looks super yum…..I luv it with rotis and rice too…Super tempting clicks! Perfect with roti and rice….bookmarked!! Really very wonderful recipe…brilliant idea for kids lunch box..will try this out soon. The recipe is mouth watering as usual and feel like doing now itself.Since i'm a beginner to cooking i'll be having lots of doubts so plz dont mind it.What u exactly mean by thaw panner. Omg, seriously am drooling over ur paneer jalfrezi,salivating here..
What a lovely roll! Will be great for a picnic treat. Colorful dish…love the addition of nigella seeds….looks delectable…. Sounds tasty and yummy…. Great pics…. 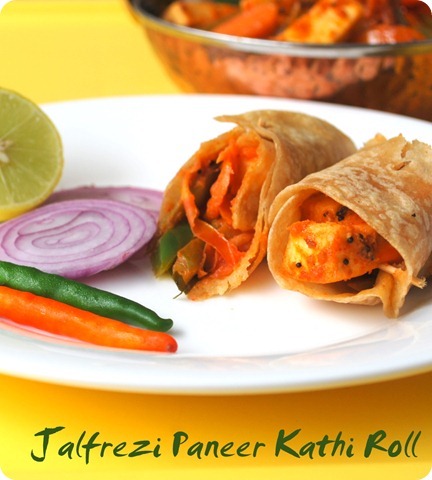 I love kathi rolls.. like the addition of veggies in your version! the last pic looks as if painted:)I liked this recipe. I made paneer today. well next time I will make this! sound simple and nice. Paneer looks delicious dear. Very colorful and excellent presentation. Drool drool.love the idea of kathi rolls. Looks super yumm..colouful and inviting. Love this veggie curry with paneer. looks as mouthwatering as your other dishes!! going to try it sometime. Woow looks yumm..fantastic idea for lunch box esp rolling it inside chapathi like a burrito! The roll with paneer looks absolutely stunning! Anything Paneer and it becomes my instant favorite.You have made it more interesting with the chapathi roll..Yum! Wish You a Very Happy B'day and Many More Happy Returns Raji! Very tempting dish. Loved the way you made it as a filling in the rolls. You truly have so much patience to present with step by step pics. Looks Yummy….My daughter is sure to love it…Beautiful clicks.. 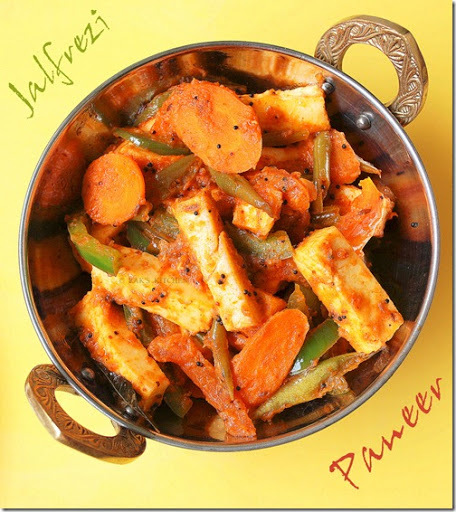 I'm not a huge paneer fan but the jalfrezi looks totally mouthwatering, trust me! I can have it all, minus the paneer. The first picture is too appetizing, ah! Looks stunning…The whole post looks colorful. beautiful step by step pictures, I love to keep staring at them 🙂 the dish has turned out perfect and it's indeed a great filling for rolls. Belated b'day wishes dear:) have a great year ahead. God bless u with all that u aspire for. U have a wonderful blog..Love the step by step snaps and details. Do visit mine as time permits..
Mouth-watering recipes are, as usual, and feel like now I am a beginner to itself.Since cooking I doubt there will be many such people do not mind it. That's great and this night aam KI chutney is very sweet with that and I think it just in case, I am getting made for those who want to eat another phulkas. The photos look as tempting as your recipe..
How do you put text on your photos? Can you give us a tutorial? Hi mahek, I use either picasa or photoshop elements tp write text in the picture. Send me a mail to the ID given in top right of the page(FEEDBACK) and I can help you with pictorials. I tried this today and it was so delicious… yum .. yum … yum !!!! Thanks for sharing. I'm serving this with rice for my kid. a really lovely dish! It was really delicious….Thanks! May be before adding paneer you can add.